Both the newly announed DROIDX2 and Xperia PLAY are up on Verizon’s website – one of them to buy right now and the other to pre-order. The DX2 will likely ship out to your house this afternoon or tomorrow, but as we told you yesterday, can be purchased in non-corporate VZW stores today if you don’t feel like waiting. 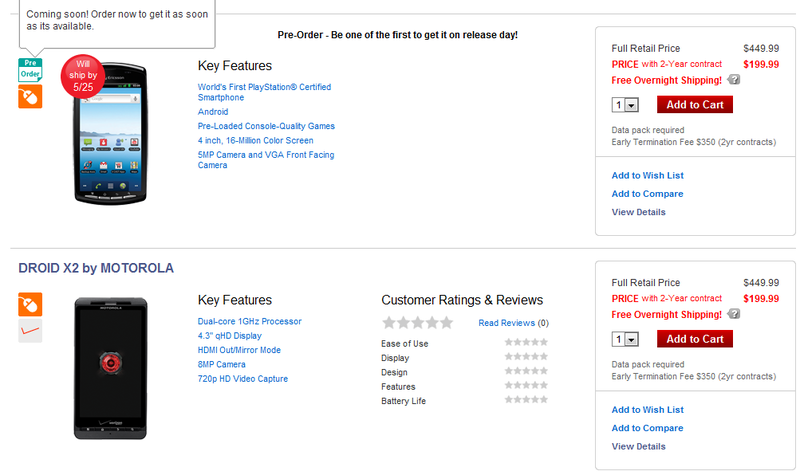 The Xperia PLAY on the other hand is just a pre-order and will ship some time around 5/25. Each phone is listed at $199 on 2-year contract or $449 at full retail. Again, we’re loving this new approach to full retail pricing from Big Red – please keep it up.